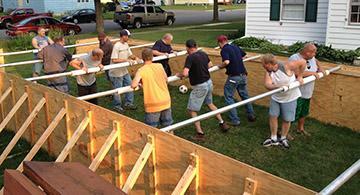 Wednesday evening, July 30, a group of friends gathered at the Mark and Lori Cacka home in Brownton to try out the “human foosball” arena that will be used for Brownton Area Resources for Kids” annual fundraiser on Saturday, Aug. 9. Lori Cacka took a short video of the practice session and posted it on her Facebook page. Since then it has gone viral. “The Rock 101.9” radio station has shared it on its website. Others have posted it to YouTube. CNN called Mark Cacka Friday and interviewed him. “She (the CNN reporter) thought it was a really cool idea,” said Mark Cacka. “She called me ‘brilliant,’” he added with a laugh. But the idea of a human-sized foosball table isn’t unique to the Cackas. His family came upon the idea while visiting at his brother-in-law’s parents’ summer place near Alexandria. “There’s a small town up there that happens to have a human-sized foosball arena,” said Cacka. BARK began raising money for activities for Brownton area kids after the McLeod West School District folded in 2009 and the Brownton school building was closed. “We wanted to make sure we’d still have summer and winter activities for kids locally,” said Cacka. The Cackas are among many who belong to BARK’s leadership committee.